The Homolovi Visitor Center includes exhibits, a gift shop, and restrooms. Hours: 8 a.m. – 5 p.m. The park is closed on Christmas Day. The visitor center is fully accessible by wheelchair. Most programs and special activities take place at the park visitor center. A variety of additional historic state parks are located throughout Arizona. Take a look and plan a trip! A perfect spot to stay for a while and take in the area's rich cultural history. Tent and RV camping opportunities are available for visitors to enjoy the relative solitude of this high desert setting. Sleep under the stars just as the original inhabitants did here thousands of years ago. This park has modern, handicap accessible restrooms located at the Visitor Center and campground. 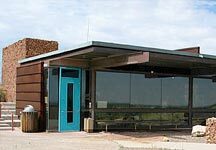 This park has a gift shop that offers books on the natural and cultural history of northeastern Arizona, including unusual and rare books. The Gift Shop also has an excellent selection of Hopi and Navajo artwork. The Homolovi Visitor Center includes exhibits explaining the archaeology of the ancient people of Homolovi. When residents of the area left, they traveled north and joined the people living on the Hopi Mesas, becoming ancestors of the Hopi people of today. The art of the Hopi reflects this heritage. 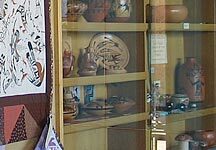 Additional exhibits tell of the continuing tradition of Hopi pottery, carving and other art forms. The work of various artists including the art of Hopi children is incorporated in a changing exhibit. In addition, the park maintains a collection of returned artifacts from within the Winslow area. These include prehistoric pottery wares, stone and bone tools. There is also historical art works by Fannie Nampeyo, Charles Loloma, Paqua Naha (First Frog Woman) and Helen (Feather Woman) Naha from the late 1880s to the late 1960s. Whether you're an astronomy enthusiast or just enjoy looking up at the night sky, the Winslow Homolovi Observatory (WHO) is open for solar and star parties. The Moore Telescope (Celestron CGE Pro 14-in. Schmidt-Cassegrain) is computerized with a database of over 40,000 celestial objects and the structure is a donation to Homolovi State Park from members of the Little Colorado River Valley Astronomy Club, the City of Winslow, and local merchants. Our observation area has additional telescopes and Hydrogen-alpha light solar telescopes for daytime solar viewing. Astronomy events are held monthly with special programs througout the year. Arizona State Parks and Trails Astronomy events can be viewed online at azstateparks.com/star or at nightsky.jpl.nasa.gov/event-list.cfm. A dump station with potable water is located at the park campground for registered campers. Noncampers must pay a $15.00 fee. Showers are available throughout the year for use by people registered at the campground. Picnic tables with shade are located at the park visitor center, along the road to Homolovi II, and at Homolovi II. Although there are no specific equestrian trails in the park, horses may be used on the dirt roads. Horses should not be ridden cross-country due to the presence of prairie dog towns. Homolovi is an excellent spot for viewing raptors and grassland birds. Species include northern harrier, redtail hawks, golden eagles, kestrels, horned larks, roadrunners, ravens, burrowing owls, and numerous other species. Mammals include elk, coyote, prairie dogs, porcupine, badger, jackrabbits, and cougar. Download the Birds of Homolovi State Park list here. Artifacts, rock art, and other cultural items/sites are protected. All natural resources are protected. Maximum of two vehicles per campsite with up to six adults, no more than 12 people. Camping permitted in designated sites only.